Popularity hasn't desensitized Tune-Yards frontwoman Merrill Garbus. Four years on from the commercially successful and socially conscious Nikki Nack, Garbus and bassist Nate Brenner are back with a fourth album that gazes headlong into the catastrophe of American life. I can feel you creep into my private life finds Garbus speaking to white privilege, environmental disaster and social conditioning in concerned, sometimes apocalyptic tones. It's not all doom and gloom, though. 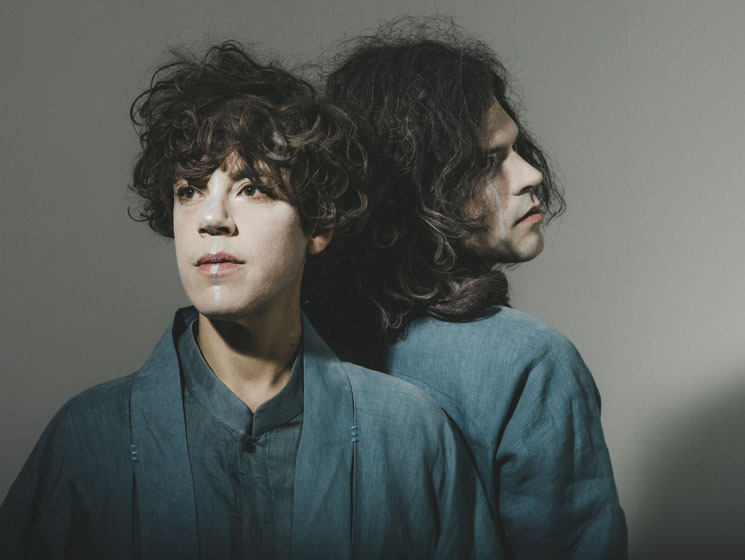 Tune-Yards' penchant for energetic, rhythm-oriented pop remains intact, but streamlined production and an increased emphasis on electronic beats make these new songs sleeker than anything else in the band's catalogue. This emphasis on dance music was crucial for Garbus to process the lyrical content. "I think it's necessary that the lyrics come from months and months of writing what's going on with me," she says. "So I think for me to get through those feelings and those experiences, it's been kind of necessary to dance my way through them." I have a radio show on Red Bull Radio called C.L.A.W., which stands for "Collaborative Legions of Artful Womxn," and we are about to release our first film score for a film called Sorry to Bother You. That's probably enough, other than touring an album, right? I am pretty obsessed with this book called Radical Dharma [by Rev. angel Kyodo Williams, Lama Rod Owens and Jasmine Syedullah], and looking at specifically how Buddhism instructs us on social justice. I moved to Oakland to come be with Nate Brenner, who is the other member of Tune-Yards. I came out here to be with him, and I stayed because it is more invigorating and diverse, by which I mean majority African-American, and also representing more immigrant communities and languages and cultures than any other U.S. city. I was talking the other day about the Storm King sculpture park — I don't know if you've ever heard of it. I'm going to say [that] because of its many sculptures, but it combines to create an atmosphere where your scale feels really different, as these sculptures are so huge that you start feeling very small. There are so many sculptures represented there. Alexander Calder's "The Arch" was the one I specifically remember, but I would say all of them. I would say, most recently, the Solange show at the Greek Theatre — the energy she brought and being able to feel the crowd and feel her relationship with the crowd, even in such a huge venue. Lately, that's been the most powerful experience. Career high: There have been lots of them, but winning the "Pazz & Jop" [poll], which is the Village Voice's culmination of all critical acclaim for a year. That was in 2011 or 2012. Career low: I don't know. Probably playing to one college student at a gig when I was first starting Tune-Yards. An audience of one. I have no idea. I'm sure people say many mean things about me that I am unable to hear. It's not often that I would tell people to shut up, but I think people often need to check themselves when they are standing in judgment of other people on social media. I like that I'm generous. I don't like that I sometimes consider other people's needs before my own. Sleeping in, walking around Lake Merritt, which is near our house here in Oakland, and going to our favourite breakfast spot. I don't listen to anybody's advice, and then I regret it later on, but I would say probably caring what other people think about me. I have been advised by so many people to just focus on my work and not get bogged down by other people's opinions, and I think it's only recently that I've come to understand the difference between taking in criticism and worrying about what people think about me. I guess disrespect. And no, so far we have not kicked anyone out of the band, nor bed, for that. Happy times. I spent a lot of time in Montreal when I started Tune-Yards. Tune-Yards wouldn't exist without Montreal, and without my friends and without the camaraderie and the way people support each other in art there. I'm going to say Thriller. I'm not sure if it was with my own money, because I was very young, but I have a feeling my parents probably had some kind of allowance system through which I could get such a thing. You know what, I take that back. It was the cassingle of Björk's "Human Behavior," now that I think about it. House cleaner. I was doing that when I was a puppeteer, which was pre-Tune-Yards. I mean, you never forget cleaning people's houses, and long hours spent wishing I was doing something else. I would be committing more time to activist, social justice causes. Disconnection between humans. Not understanding each other to such an extent that we commit violent acts on each other. We saw David Hasselhoff at Coachella one year, and that was pretty bizarre. I think that I sat on his lap. I think Lotte Lenya and Bertolt Brecht of the German theatre. And what would I serve them? I suppose I'd serve them the closest thing to German food that I could muster up. I don't think she does. She's also a musician, so I think I'm doing something that she's at least mildly familiar with. "Radio Generation" by Pat Jordache — he's my good friend up in Montreal. Because I hope that if I die before Patrick, that he will be at my funeral, and because it's one of those songs that speaks to community, and to the community that brought me up, and that communities are possible, and the possibility of a love of community. Tune-Yards' new album I can feel you creep into my private life is out January 19 on 4AD. They play Vancouver on February 27, Toronto on March 6 and Montreal on March 7.